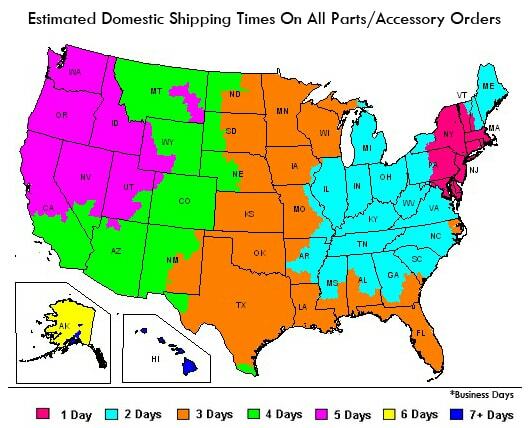 All domestic PARTS & ACCESSORY purchases made on NiceCycle.com are delivered within 3-5 business days. International orders may take up to 10 business days. All FAIRING/BODYWORK purchases made on the NiceCycle.com are typically shipped within 7-10 business days, with a routing time of 3-5 business days; custom orders or airbrushed orders take a bit longer to produce as each order is unique to the customers specific request(s). This is an estimation ONLY. Shipping times vary during peak season due to high production volume. Shipping is always FREE on complete fairing set purchases, this applies to International orders as well, except shipping to Brazil or South Africa. Additional charges apply. Please inquire. We sell and stock only the best motorcycle parts! We use only the highest grade ABS plastic available! Our fairings are individually inspected before shipment, our quality control is unsurpassed. Our fairings are painted by skilled professionals with years of experience. Side by side with OEM you cannot tell them apart. NiceCycle Fairings offer superb fitment; the best in the aftermarket fairing industry. Heatshield insulation is included with all fairings that require it. We do NOT guarantee a direct color match with factory OEM bodywork. Shopping online with NiceCycle is easy! We accept the following payment methods through our website; phone orders are accepted as well, just give us a call! VISA - MASTERCARD - DISCOVER - AMERICAN EXPRESS Credit Cards, Paypal and Money Orders/Cashiers Checks are accepted as well. Please contact us for money order payment information. Installing your NiceCycle fairings is simple, there is no need to call a professional or take them to a dealership for installation like many other websites recommend. If you are familiar with your bike you should have no issue, it is a basic bolt-on job! All single part, individual piece or partial kit orders are made at the time of purchase. Single parts or partial kits are designed to compliment NiceCycle Fairings and are not guaranteed to match up color wise, or design wise with OEM fairings, or fairings of any other type besides fairings purchased directly from NiceCycle. All single part, individual piece or partial kit orders are non-returnable or refundable, this includes unpainted fairing pieces as well. When ordering single parts or pieces of fairing kits; we strongly recommend referencing the original order number from your full fairing kit purchase with us. Here at NiceCycle we are dedicated to making sure your purchase is a satisfying one! If there are any issues with your purchase please contact us so we can do what it takes to make it right and get you back out on the road! Returns are accepted at NiceCycle.com. All returned items must arrived in their original condition, un-mounted and free of defects. Returns are subject to our specific time frame allotted for returns (see below). Return shipping is the at the expense of the customer. There is a 15% restocking fee on all returned items. Cancellations or orders that are in progress, and cancelled by the customer will be subject to a 15% restocking/handling fee. All orders are "custom" made at the time of purchase and cannot be fully canceled once production has commenced. Fairing orders that have been customized specifically for an individually customer cannot be cancelled or returned as these are one-of-a-kind items for that specific individual. Fairings purchased that are "airbrushed" cannot be returned as they are "one-off's" specifically made for that customer. NiceCycle does not offer OE color matching, nor do we guarantee any type of color match to OE specifications. We do not accept returns on custom bodywork due to non-color match. Incorrect, damaged, or missing item[s] must be reported within 72 hours of the time the product[s] are received. You mount it, you bought it. Warranties are limited to or through ORIGINAL PURCHASER of products[s] ONLY. All warranties and liabilities of product[s] are null and void as a result of improper installation, improper use, modifications of product[s] and abuse of product[s]. Any parts returned must be un-mounted. All retail packaging must be in tact and the item cannot show any signs of use. Parts that are returned used or not with original packaging will be refused and returned to sender. Return shipping fees are the responsibility of the customer unless an incorrect part is shipped, in which case NiceCycle will cover the return shipping fees. Items that are damaged in transit are fully covered by our warranty and will be replaced at no charge to the customer. Parts are no longer returnable after 30 days from the date of purchase.